We know that the holidays can be a busy time. There is so much to coordinate and plan. The last thing you need in the middle of it all is a trip to the airport. The thought of sitting in traffic instead of using your time effectively can be enough to make anyone crazy. We have a solution! Annapolis Flyer Cab provides dependable holiday transportation to and from the airport. You can schedule and book the service ahead of time. That way you have the peace of mind knowing that your loved ones will get picked up on time and arrive into town safely. Here are some reasons to book your holiday transportation today. It is super exciting when the kiddos come home from college, especially if this is the freshman year. Everyone is super excited to see each other. But, don’t beat yourself up if you cannot get away from the office or the time they arrive is super inconvenient for your schedule. Let those guilty feelings fade away knowing that we will be there, with a warm car and a smile. Annapolis Flyer Cab is the next best thing to you! Our drivers not only have driving experience, but we also pride ourselves on our excellent customer experience. Annapolis Flyer Cab is more than your typical taxi company. We also provide transportation services for the homebound and the elderly. Therefore, we have extensive experience with seniors. Our drivers understand individual needs and will ensure your beloved relatives with the very best assistance and care. We will take care of their luggage and assist them in and out of the car, from the airport curb to your front door. Schedule a pickup today, and we will be waiting with a warm car, ready to help in any way that we can! Nothing can seem more hectic than traveling with kids. All the luggage and gear, compiled on top of their excitement can be overwhelming for everyone. Let Annapolis Flyer Cab simplify your travel experience. We have a variety of vehicle options, including SUV’s, to ensure you all will travel safely and calmly. What could be a better way to start or end a wonderful family vacation than a stress-free ride to or from the airport? Are you traveling this holiday season? Why not enjoy your self from the moment your vacation starts the moment you arrive back? Eat, drink, and be merry and never worry about getting behind the wheel of a car! 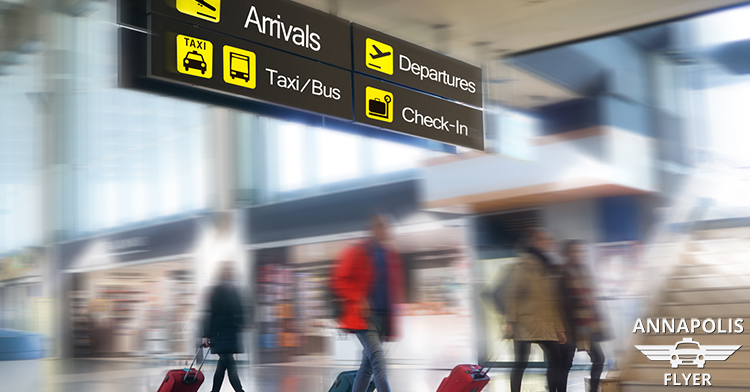 Allow us to provide safe and stress-free holiday transportation to and from the airport so that you can have fun. Book your reservation with Annapolis Flyer Cab today, and know precisely when and where you will be picked up. Whether you are traveling solo, as a couple, or a large group, we have you covered. Treat yo’self this season! Contact Annapolis Flyer Cab today and make your reservation for holiday transportation to and from the airport. This season let you and your loved ones arrive in style stress-free, ready to start your New Year off right! Schedule your ride now.